As I travel to different cities, I invariably read an article on the train or plane about some local cocktail bar, or a local bartender who has created a fabulous new cocktail, or the types of music to play at a cocktail party. 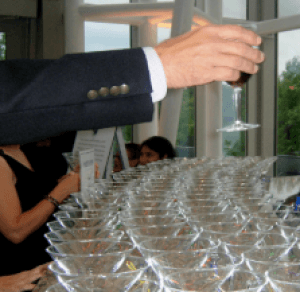 Why not incorporate a cocktail element into your benefit auction procurement plan? Is there a trendy bartender in your town? Maybe a good hangout that everyone heads to on Friday night after work? At one benefit earlier this year, I sold a clever cocktail package. It was two-hour cocktail instruction for six people hosted by a local Alexandria mix-master who has received a lot of press for his creative work. It sold for $900 – almost twice it’s value – and drew lots of interest from the crowd. This particular bartender had won the regional semi-finals for the Domaine de Canton Bartender of the Year competition in December, beating out nine top New York bartenders. No doubt about it, he had a strong resume. But even if you select someone with less credentials, this is a good package. Most people aren’t regularly making unusual cocktails, so any personable bartender (and what good bartender isn’t personable?) will be able to teach your guests something. The other advantage of asking for this auction donation is that there’s a good chance that if a trendy restaurant won’t donate you a dinner, they might be open to donating a cocktail-only instruction because it would cost them less. Go ahead — impress your local establishments with your creativity and give it an ask.